Amanda Kwaza, MSSA President, giving the opening address at the longest running esports championship in South Africa. 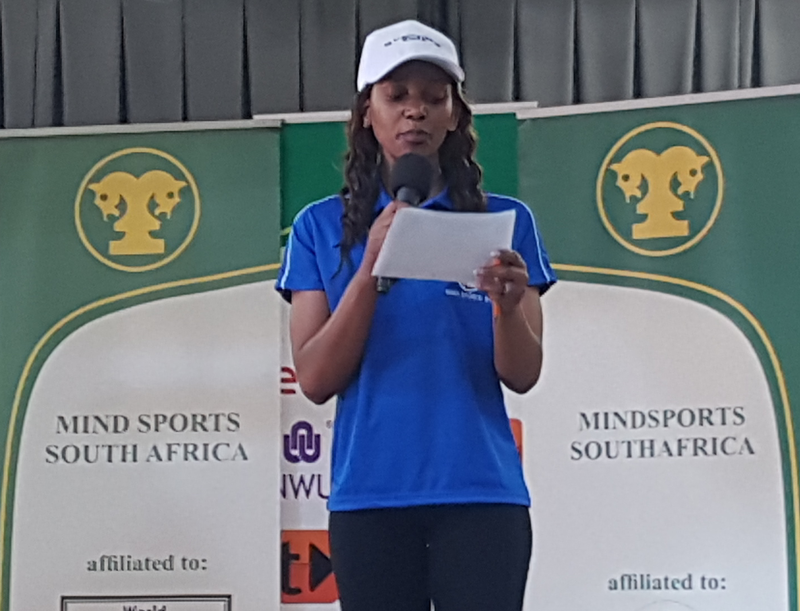 Mind Sports South Africa (MSSA) held its 35th South African National Championships at Fakkel School of Skills on 1 and 2 December 2018. As usual, the school was a superb host, and the championships ran smoothly and without a hitch. At 35 continuous years, MSSA's SA National Championships is breaking records. However, not all the various disciplines have been played for the full 35 years. Wargames heads the bill at having been played at all 35 National Championships, with Board games (in the form of Morabaraba) having been included in 1996. Shortly thereafter, in 1997, checkers made its debut. It was only in 2005, even though MSSA had been running Provincial Esports events since 1998, that Esports made its way into the SA National Championships. Despite the pedigree of the other disciplines, it is now esports that contributes the largest amount of participants, and has more games (periods) being hosted than any othe discipline. Even with Esports only having been represented at MSSA's SA National Championships, it makes the esports portion the oldest running esports in the country, if not the world! Eleven (11) games (periods) were played, of which one (1) was a wargame, three (3) were board games and the remaning eight (8) were esports titles. The championship was hard fought, and the standard exhibited showed a marked improvement over previous years. New Athletes' Representative demonstrates great joie de vivre. Saudah Bhaimia is awarded the Sportsmanship Award. 2019 is a year alive with possibilities. Paul Roos Gimnasium heads the rankings. Eclipse CS:GO is now leading MSSA's rankings. Youngster from Sasolburg leads the rankings. Tekken 7 ladder for 2019 announced. Tekken 7 now by Wallace led. Baber 'Tekken Guru' Abbas is back at the top. The new national team selection criteria. So you wanna be a Selector? Changes to the Selection Committee. MSSA's umpiring course - 19 January 2019. Keeping South Africa's flag flying high. Cobus van der Wath leads the rankings. Curro Heritage House affiliates to MSSA. Curro Krugersdorp joins the fray. MSSA's Elected Office-Bearers for 2019.